When asked to classify his writing, Farley Mowat has quipped, "The only people who belong in pigeonholes are pigeons." Mowat's works are difficult to classify since he is a masterful storyteller as well as a naturalist. One of Canada's most widely read authors, adults and young readers alike are attracted to his accelerated narrative style. Mowat refers to himself as a "saga man," or one who earns his living as a roving bard, retelling ancient tales in the Norse tradition. In his memoir, My Father's Son (1992) Mowat describes his father, a sailor, librarian, and writer, who engendered in his son a love of nature and writing. After Mowat's family relocated to Saskatchewan, he became fascinated with the natural world and published a pamphlet documenting his forays into the wilderness when he was only 12. By 15 he was a certified ornithologist. 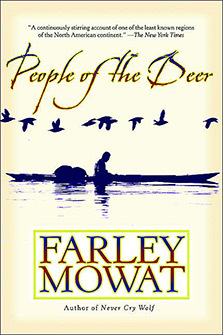 As a university student in biology, Mowat took part in an expedition that inspired him to write the award-winning People of the Deer (1952). The book described the suffering of the Inuit people due to exploitation by the white settlers of Canada. He continued to write controversial nonfiction narratives such as the acclaimed Never Cry Wolf (1963), which was critical of Western society's treatment of indigenous peoples and the environment. Mowat is a prolific writer of nearly 40 books: nonfiction such as No Birds Sang (1971) and The Regiment (1961) about his World War II experiences, childhood memoirs such as The Dog Who Wouldn't Be (1957) and Born Naked (1994), and fiction for young adults. Mowat is reputed as a radical environmentalist; in 1985 he was listed in the United States "lookout book," which prevented his entry into the country.